Stewardship is the journey of financial insider John Taft toward understanding and affirming the importance of stewardship - which he has come to define as "serving others" - as a core principle for the financial services industry, the global financial system, and society at large. By defining the attributes of authentic stewardship, this book presents a path forward by analyzing the success of Canadian banks in weathering the financial crisis; evaluates the effectiveness of global financial reform efforts in making the financial system safer, sounder, and more secure; offers wealth management prescriptions for individual investors; evaluates the potential of ESG (environmental, social, and governance) investment processes as a way to instill stewardship behaviors among corporate CEOs (particularly at financial services firms); and ultimately, calls for a return to stewardship's core principles as the key to not only minimizing the scope and consequences of future failures, but also to addressing other societal challenges. Argues for a return toward stewardship, with financial services companies doing right by their customers. Analyzes the response of Canadian banks to the financial crisis to provide meaningful advice for investors and businesses alike. Inspired by Taft's experience running one of the largest wealth management firms in the country during the financial crisis and his direct participation in subsequent legislative and regulatory efforts to rewrite the rules under which the U.S. securities industry operates. From the man who made the decision to reimburse clients affected by the collapse of a money market mutual fund, comes a compelling look at why financial service companies should start doing what's right for their customers. 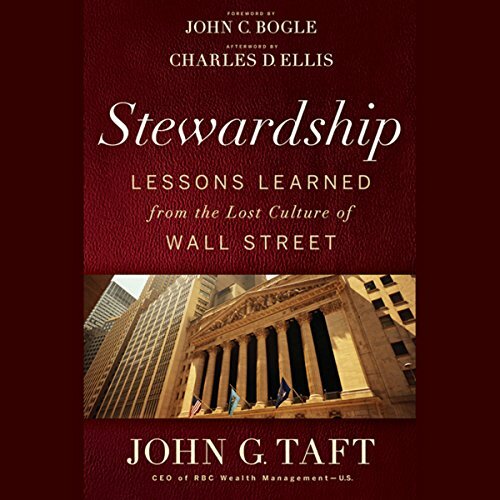 ©2012 John G. Taft (P)2012 Audible, Inc.
What did you love best about Stewardship? The most interesting aspect of this book was that it provided insight in to how the 1% view the world. For example what the author learned from the recent economic crises is that you should bolster your investments for "Black Swan" events. Some specific advice that he gives is to have two to three years of cash available to cover your living expenses. Also to have 5% of your assets held offshore. What aspect of Richard Fish’s performance would you have changed? The book was read in a manner that it came across as condescending in several sections. This book had a lot of good and insightful information in it. The author is clearly Republican and religious which caused me to cringe at some of his opinions. For example social programs were always referred to with contempt as "entitlement programs". Never was there a suggestion to cut defense spending as a method to help reduce the debt. Still worth a listen, if nothing else, to get a view from the 1%.